I was diagnosed with breast cancer 17 years ago, a total shock, and as a young mother, it was pretty tough going. I had my operation followed by 6 months of chemotherapy, which was very harrowing, and then a 4 week course of radiotherapy. But with a very positive attitude, and the loving support of my husband and family, I got through it. Also having the children to concentrate on, gave me the determination to beat it. And I did, so here I am 16 years clear now, and living my life, happy and content, and wanting to help this amazing charity. My way of giving something back. That is why I am so passionate about this charity (breastcancernow.org). The research that they do, which is funded by people like myself, is critical in finding the cure that will hopefully stop women (and men) dying from this cruel disease. I am so thrilled to be able to hold this event at the place I love and work (orchardtheatre.co.uk). The management, and my colleagues at the theatre, have been so very supportive of what I’m doing. 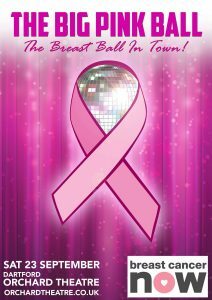 Helping me put together, what will be a fantastic evening, full of great entertainment, along with a “breast inspired menu” for dinner! The evening starts at 7pm with a glass of bubbly and canapés in the foyer, followed by dinner in the main auditorium. A fantastic range of entertainment throughout the evening, along with a raffle and auction, which will include a specially commissioned painting by local artist Stephen Oliver. Finishing at 1am. 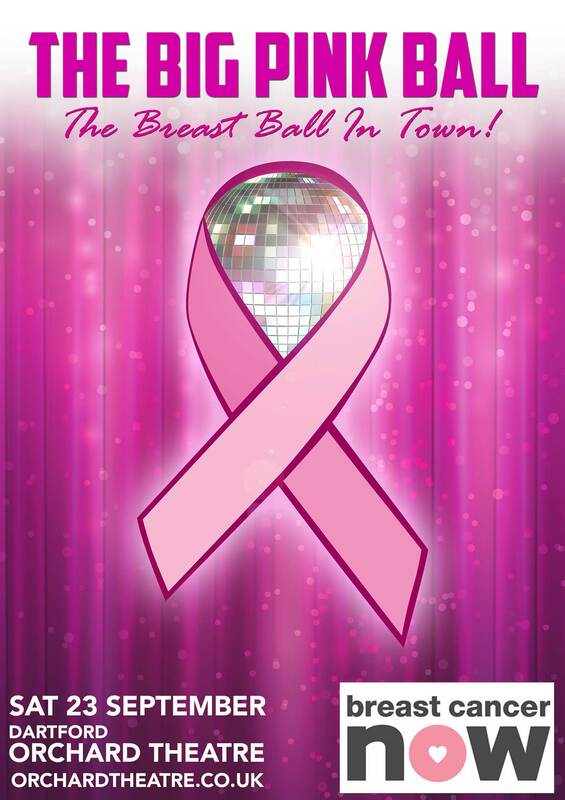 There are only a few tables left, so give the ticket office a call on 01322 220000 and be part of the Breast Ball in Town, and help save the lives of future breast cancer patients. Or book your place at The Orchard Theatre website. Tickets are priced at £55 per person or a table of 10 for £500.